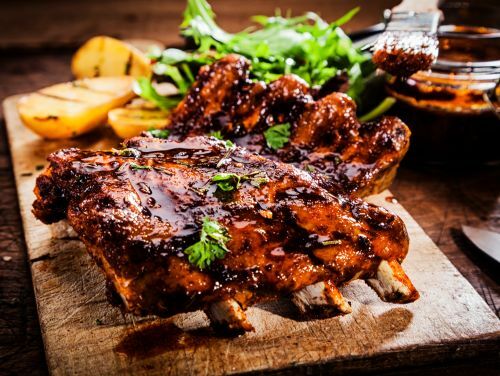 Menulog delivers for Rustic Ribs so you'll be able to track your courier on a map. Spicy sauce on the side. Served with coleslaw and a choice of sweet potato fries or chips. Half rack of pork or beef. Half rack of pork or beef, salt and pepper calamari. Tomato base, mozzarella cheese, leg ham, fresh mushroom, artichokes and olives. Traditional folded pizza with mozzarella cheese, ham, mushroom and olives. Tomato base, mozzarella cheese, pork ribs, onion, apple and fresh rocket. Tomato base, mozzarella cheese, cabanossi, salami, Kalamata, olives, anchovies, chilli and shaved grana padano. Tomato base, mozzarella cheese, rocket, grana padano and prosciutto. Tomato base, mozzarella cheese, Italian sausage, baby spinach, fresh chilli & pine nuts. Tomato base, cheese, mozzarella and basil. Tomato base, mozzarella cheese, roasted eggplant, roasted capsicum, onion, olives and mushrooms. Tomato base, mozzarella cheese, cabanossi, hot salami, ham, mushroom, capsicum, onion, olives and pineapple. Tomato base, mozzarella cheese, sweet pineapple and smoked ham. BBQ base, chicken, pineapple and mozzarella cheese. BBQ base, bacon, ham, cabanossi, pepperoni and mozzarella cheese. Creamy garlic sauce, diced chicken breast , bacon, mushroom, onion, parsley & parmesan cheese. Cos lettuce,celery,apple,grapes & walnuts with honey yogurt dressing. Crisp cos lettuce, bacon, egg, white anchovies, croutons, shaved Parmesan and Caesar dressing. Chunks of tuna, cos lettuce,olives,tomato,potato,boiled eggs & green beans with white wine vinegaratte. Char grilled chicken breast, grilled haloumi cheese, roasted pumpkin, fire roasted capsicum, tomato, roasted nuts, rocket and pesto dressing.